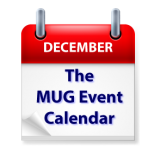 Holiday parties are the most popular event on this week’s MUG Event Calendar, but some will have notable guests. Bob “Dr. Mac” LeVitus will talk about how to work smarter to a Texas group, and David Sparks will address a Connecticut group. A Wisconsin group will cover Apple TV, and a Colorado group will continue a discussion of cord cutting. Capitol Macintosh – Bob "Dr. Mac" LeVitus on how to "Work Smarter with your Mac"
MacGroup-Detroit – What’s New with Apple: The new iPhone 7, the New MacBook Pro, iOS 10 and MacOS Sierra. This will be Part 1.